Most of the time, when I'm on one of my longer runs, out on a trail, far from town, I find all the sky and cornfields and farms pretty. I took this photo yesterday morning. My brain allowed me to enjoy such scenery for right around three miles, when it then decided to bring up an image from this movie- you know, for fun. That being said, if a child ever did run out of the corn and into my path, I think it's safe to say I would have a fatal heart attack, whether they referred to me as an "Outlander" or not. Still not sure why I don't run with pepper spray. To distract myself from the prospect of He Who Probably Doesn't Walk Behind The Rows, I listened to a podcast where an ultra runner was interviewed about all kinds of stuff related to running super long distances- she was one of the top female finishers at Western States 100 this year- and one of the things she talked about was how ultra running strips a person, leaves them at their most raw and vulnerable, and exposes their truest self. 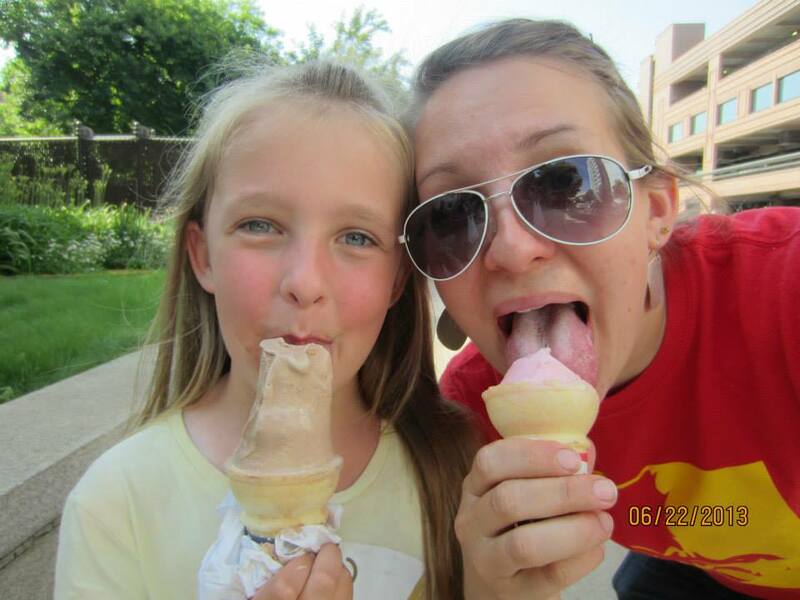 All I could think was that I feel the same way about watching people eat ice cream. Look at that one in the middle. He is not kidding around about getting that goodness into his mouth, and he tends to attack much of the rest of his life in the same way. See? Raw, exposing his truest self, and he didn't even half to run 100 miles to do it. So maybe I'm not meant to be an ultra runner, or even a long distance runner (discussing the fact that I don't currently have any ambitions to run a full marathon with my mother, her response was: "I will come up there and hog tie you if you try to run that far. "), but man, can I get after an ice cream cone. It's funny, my second thought upon finding this photo was, "Aw, look at seven-year-old Adelaide!" but my first was, "Mmm, I remember that strawberry rhubarb ice cream." 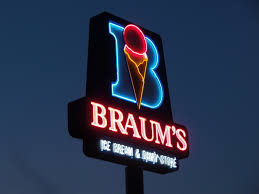 Sadly, one of the few really serious and devastating things that Iowa lacks is Braum's. If you just gasped, all I can say is I know, right? Feel sorry for me. Just a warning - a few years back I did a kind of tour where we went to count corn plants and ears in random fields. So it's possible a crop counter might emerge from the fields un announced. We did start pretty early in the morning.... I also have to say I was rather terrified of walking into those corn fields. If you get disoriented it would be possible that you could never find your way OUT of the field. And now I know that those possessed Children of the Corn live in there - AAAAH! Thankfully, I have never seen that movie. 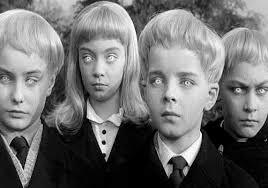 In your photo of the three darling children eating ice cream, I love the facial expression of the child on the right. I think that's my ice-cream-eating facial expression - ah, heaven! Chuckle. I've missed taking the time to read your blog. But I am willing to go and eat some ice cream so you can continue your amateur psychology on me. Yummmmmmm. Newton has The Cardinal Corner. Peanut butter fudge ice cream. The best. Comment: I've made strawberry rhubarb cheesecake ice cream and it was delish.